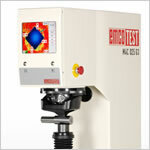 The hardness testing unit at EMCO Maier GmbH was set up in 1954 in the Austrian city of Hallein near Salzburg. As part of the restructuring process at the EMCO machine tool manufacturing plant, mostly concerned with the production of lathes and milling machines for industrial use and technical training, the hardness testing business sector was outsourced in 1996 and a new company, EMCOTEST Prüfmaschinen GmbH, was established to serve this purpose. EMCOTEST started life in September 1996 employing the former staff of the hardness testing department and was based in a part of the old plant in Hallein. EMCOTEST’s extremely positive commercial development led to the move to a new base in Kuchl-Brennhoflehen in May 2001. We work together with the very best suppliers and dealers all over the industrial world to promote our highly valued products. Successful developments and rapid expansion enabled the company to achieve its declared goal of consolidation and expanding on its market position. The foundations of our success are based on two pillars of business activity: standard systems and special machines and systems, as well as on expert and highly motivated staff.